I really should have titled this post “I Love New York!” Why? Because where else can one be at their desk in their office near the end of the work day, get an email about a vagrant western bird in a city park, and be looking at it fifteen minutes after leaving said office? Nowhere but New York City! And that is precisely what happened today. 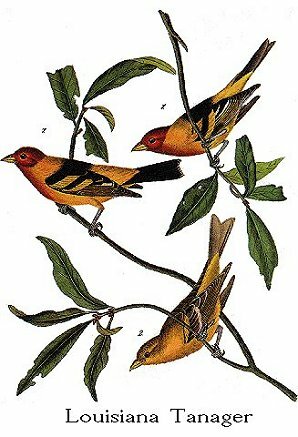 At about 5 pm an email went out on one of the New York City listservs reporting a Western Tanager in Central Park. At 6 pm I left my office, walked a block to the subway, jumped on the C train, took it to 81st Street, and was looking at the tanager almost immediately. The best part is, I didn’t even have my binoculars! I just jumped the first birder I saw, beat her into submission, and took her Leicas so I could see the bird. No, wait, that is what I was intending to do if I couldn’t get someone to let me borrow a pair upon my arrival, but, fortunately for both the potential victim and myself, there was a nice birder who let me borrow his pair for a couple looks at the young male (or perhaps female) tanager. The bird, like the Scott’s Oriole that delighted birders in Union Square Park earlier this year, was coming to sapsucker wells to feed. It would alternate between the viburnum bush with the sapsucker wells and the bare tree above it, at least while I was there. I couldn’t stay long, mostly because I wanted to get home to dinner, but it sure was worth the short detour on my commute. Many thanks to the original finder of the bird, Matt Pelikan, and to the folks who posted about it on the listserv. To see a photo of the bird go see David Speiser’s shot here. Serves you right for not having your binoculars with you. Will you start carrying them around now? Guess what Corey, Killdeer are back!!! Woo-Hoo!!! It’s really boring here in Albany right now. This, THIS is what happens when I can no longer check the intertubes from work! And tonight I have a meeting, so that’s a no-go. Hope the little dude(ette) sticks around until Friday. @Will: Get down here for a visit then. The cats would love to share their futon! @Jochen: I will never learn! @Carrie: It’s been seen this morning so there is hope! After I had missed my second large raptor during my first trip to Namibia on the campground while commuting between the tent and the … er … restrooms, I even took my binoculars to the shower (where I stuffed them into a plastic bag to protect them from the water while actually showering). It must have looked quite ridiculous, walking from tent to shower with nothing but sandals, shorts, a towel over my shower, a plastic bag in hand and a pair of binoculars around my neck. But hey, no more fouled up lifers circling above the camp ground! Well actually, I don’t ever carry showers around. Yeah, now’s the time of year to stick the bins in the bag when I got to work. Just in case, yaknow? Strange Find and I saw somewhere else where this bird had arrived! No bins Corey? For shame. I had my bins with me and I was only in NY for 3 hours waiting for a JFK connection. Thanks to this bliog reminding me to go to central park for 30 mins after visiting the AMNH I connected with ease thanks to the superfriendly NY birding contingent and then started adding other lifers like…er…chickadees and sparrows and flickers and stuff.